– Game 1 of the World Series commences tonight in St. Louis as the Texas Rangers face the St. Louis Cardinals. Just as expected, this series isn’t getting the recognition it deserves. There are no Yankees, no Red Sox and no Phillies. What you have here are two franchises that aren’t as “mainstream” as maybe some of the teams I mentioned. For the casual baseball fan, it maybe hard to name anyone playing in this series not named Albert Pujols. But there is a lot to like about this match up. The Cardinals really shouldn’t even be in this position. They had to overcome a huge deficit of 10 1/2 games in the Wild Card race to even make the playoffs. They also had to overcome two highly touted teams in the Phillies and Brewers to make the World Series. The road wasn’t easy for the Rangers either. Defeating a team as hot as the Rays were and taking out a Tigers team that eliminated the Yankees in New York is no easy task. The Cardinals should be the favorites in tonight’s game and maybe even the entire series. Chris Carpenter is starting, and he is on 6 days rest, which means that he will be available for 2 or possibly 3 starts. The Cardinals also have the home-field advantage, which may not seem like much in Baseball compared to Basketball or Football, but it is something to take into consideration. Despite all of that, I am going to take the Texas Rangers in 7. Texas is desperate. They don’t want to lose back-to-back World Series. Even though the Cardinals have a stud in Pujols that can win games on his own, I still believe the Rangers have a better line-up. Nelson Cruz won the ALCS MVP, hitting 6 home runs, and he is only 7th in the line-up, which goes to show how amazing a line-up they have. Josh Hamilton, Adrian Beltre and Michael Young are all capable of hitting the long-ball, and that may be to much for even a guy like Carpenter to contend with. I wouldn’t be shocked at all if the Cardinals took it though, as this series should create some interesting Baseball all-around with these 2 highly gifted and talented squads. But the Rangers are too good a team to lose the two years in a row. Give me the Rangers. – Dallas Mavericks star Dirk Nowitzki has been denied the opportunity to throw out the first pitch at game 1 of the World Series tonight by the MLB. The Texas Rangers offered Dirk as a possibility to the league, but the MLB shut down the request. MLB spokesperson Pat Courtney says, “You want the club’s input in what makes sense for them and then we talk about what makes sense for the team and a good broad-base national appeal”. This is a story that actually really bothers me. At first, I believed the only reason he wasn’t allowed was because he was an NBA player, and any use of a player at this time might show favoritism to one side during this NBA lockout. 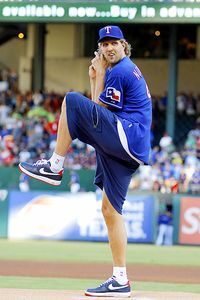 Apparently that isn’t the case though, so based on that quote by Courtney, what I take away from this is Dirk Nowitzki isn’t a big enough name to be throwing out the first pitch, which is complete crap if you ask me. Dirk might be the most famous person in the state of Texas right now. He just pulled off one of the most memorable playoff runs in NBA history and led the hometown Mavericks to their first ever NBA Championship. Not only that, but he is known for being a huge Texas Rangers fan, and has actually already thrown out a first pitch at a Rangers home game. I mean come on, it is a first pitch. Just another act of disrespect to a man who probably doesn’t have the “name” like a Lebron or Kobe, but is still one of the best and most respected players at his sport around the globe. If MLB was smart, they would take this opportunity to let Dirk throw out the pitch at another Series game to save themselves from this unnecessary mess. – The UFC 137 Main Event of George St-Pierre vs Carlos Condit for the UFC Welterweight Championship has now been postponed due to an apparent knee injury Pierre suffered during a training session. B.J Penn vs Nate Diaz will be the Main Event of UFC 137, which takes place next Saturday. This is definitely a let-down for those who were anticipating this fight, such as myself. I truly believed that Carlos had a high possibility of taking the title off of St-Pierre. At least the fight will not be cancelled entirely, as the knee injury doesn’t appear to require any surgery. Hopefully this fight does take place in the near future, and maybe even before the end of the year. It may even be able to garner more interest and buy-rates now, since Carlos was actually a replacement for Nate Diaz in the title fight. Speaking of Diaz, there is no word yet on if his fight with Penn will now be 5 rounds instead of 3 since it has been moved up to the Main Event. I would love a 5 round fight, but since the change would have to come last-minute, and the fighters need a fair warning of alterations to their fights, then I doubt it. VIDEO OF THE DAY: Obviously, Steve Young has no idea when the cameras are rolling. Nice throw, Steve.